More often than with tectonics, structural features in impact structures may reflect very rapid changes of stress fields (amplitude and direction). Among these processes, strong rarefaction plays a major role leading to tensile features independently of or at least following compression (also see the key word spallation). Rarefaction is a basic process in impact cratering, which may lead to tensile forces by low pressure possibly up to vacuum formation. So, total layer complexes may be separated from one another, and structural features are observed that can best be explained by the rarefaction model. Compared with craters in crystalline targets, the sedimentary Azuara target combined with excellent outcrop conditions allows abundant insight into a peculiar geological world. Fig. 1. Peculiar structural features in Dogger limestones (rim region, Barranco de Bocafóz, Almonacid de la Cuba). The interpenetration of the limestone layers suggests strong tensile forces. Fig. 2. Sketch of another very peculiar structural feature in the Barranco de Bocafóz, Almonacid de la Cuba. Like in the situation shown in Fig. 1, the horizontal thrust of the folded limestone layers requires strong tensile forces. A strange deformation can be observed also at the rim of the Azuara impact structure (Fig. 3) having a roughly similar counterpart in autochthonous Jurassic limestones at the eastern rim of the Ries impact structure (Wemding; formerly Schneider quarry; Fig. 4). 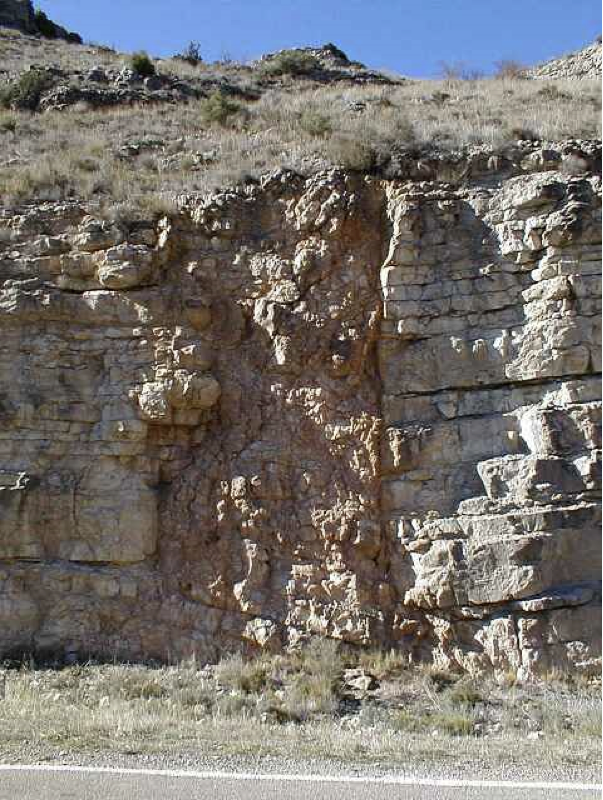 The strange abrupt change from horizontal layering to strongly deformed limestone may be interpreted by horizontal thrust under very high overburden pressure in the excavation and ejection process. Fig. 3. Aguilón, Azuara structure; Jurassic limestones. Note the bedding in the base speaking against a tectonic fault, and, generally, a tectonic interpretation of the layering offers considerable difficulties. Fig. 4. 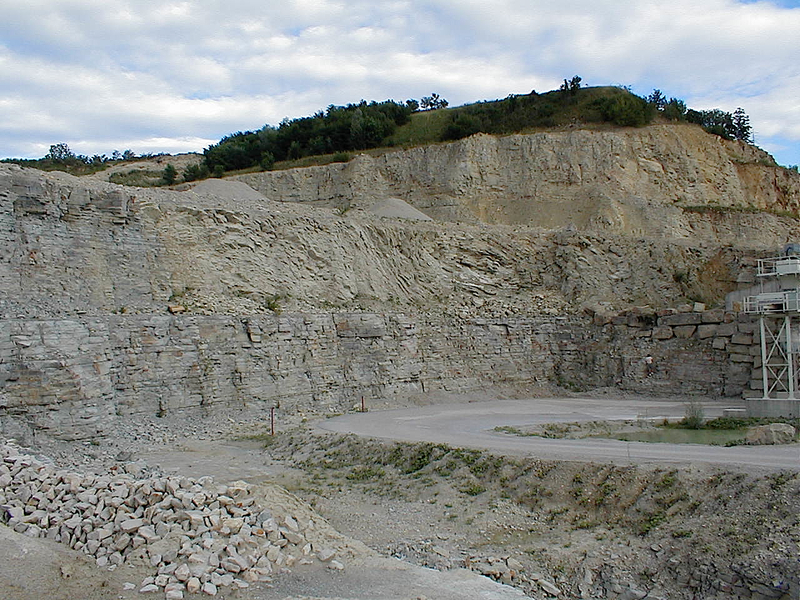 For comparison: heavily deformed autochthonous Jurassic limestones at the eastern rim of the Ries impact structure (Wemding; formerly Schneider quarry). Photo: July, 2001. Fig. 5. Unusual joint pattern, unfamiliar to structural geologists, in the Azuara impact structure (between Moneva and Moyuela villages; outcrop height about 5 m): Conjugate sets of strongly curved joint surfaces cut the Jurassic limestones into bars of approximately rhomboidal cross-section (penciled for enhancement). The strike direction of the curved sets as well as those of similar sets in several other outcrops roughly point to the center of the impact structure. Probably, the sets have resulted from impact-induced dynamic stress modulation of running fractures during the excavation flow (see model in Müller & Ernstson 1990 and http://www.impact-structures.com/ ).